Hier können (neuere, muss aber nicht), interessante Veröffentlichungen (Studien, Theorien, usw. ), die nicht unbedingt einen eigenen Thread wert sind, einfach kurz erwähnt werden (am besten mit Abstract/kurzer Zusammenfassung und einem frei zugänglichen Link falls möglich). Keine inhaltlichen Einschränkungen, es sollte aber schon irgendwas mit Wissenschaft zu tun haben . Crum, Alia J, Peter Salovey, und Shawn Achor. 2013. „Rethinking stress: the role of mindsets in determining the stress response“. Journal of personality and social psychology 104 (4) (April): 716–733. doi:10.1037/a0031201. Linthwaite, Sarah, und Geraint N. Fuller. 2013. „Milk, Chocolate and Nobel Prizes“. Practical Neurology 13 (1) (Januar 2): 63–63. doi:10.1136/practneurol-2012-000471. So einen Thread habe ich schon lange vermisst. Hier werde ich wohl öfter mal was schreiben. - komplexe neuronale Netzen zeigen ähnliche Eigenschaften wie Gehirne. Take that, Mr. Thomas Nagel. - Schlaf/Traum scheint ähnlich zur Lernphase neuronaler Netze zu sein. - Das Blue-Brain-Projekt in der Schweiz wird scheitern. Verweise zu den Originalstudien im Link. Nach allem was ich weiß, ist Schlaf für menschliches Lernen wesentlich. Die Analogie der Gewichtungsphase bei neuronalen Netzen zu nächtlichen Schlaf-Träumen lag für mich immer nahe - auch wenn sie sehr gewagt ist. Oder doch nicht? Neuroscientists have long known that sleep plays an important role in memory consolidation, helping to integrate newly learned information. In 1995, Hinton and colleagues proposed that sleep serves the same function as the baseline component of the algorithm, the rate of neural activity in the absence of input. In der Schweiz wird gerade versucht, ein Rattengehirn zu simulieren. Ich möchte nicht unken, vermute aber, daß die dort nur einen epilleptischen Anfall simuleren werden, um es salopp zu sagen. So, und jetzt muß ich noch lernen, wie ich sowas zukünftig kürzer zitiere. The plague of non-reproducibility in science may be mostly due to scientists’ use of weak statistical tests, as shown by an innovative method developed by statistician Valen Johnson, at Texas A&M University in College Station. Im Kontext der Debatte um die Schwierigkeiten, wissenschaftliche Studien zu reproduzieren, argumentiert Valen Johnson, dass das Problem die zu anspruchslosen Signifikanzniveaus sind. Er benutzt eine neue Variante Bayesianischer Tests, die eine direkte Vergleichbarkeit mit den üblichen frequentistischen Tests erlauben soll und zeigt, dass - ausgehend von 50 % korrekten Nullhypothesen - Alternativhypothesen bei dem Standard p-value von 0,05 zu zwischen 18 und 23 % fälschlicherweise als richtig angesehen werden. Dies entspricht wohl auch ungefähr der Größenordnung zu der Ergebnisse nicht repliziert werden können. Selbst ein P-Wert von 0,01 wäre noch zu schwach und er fordert einen neuen Standard von 0,005 (Johnson 2013, 4). Johnson, Valen E. 2013. 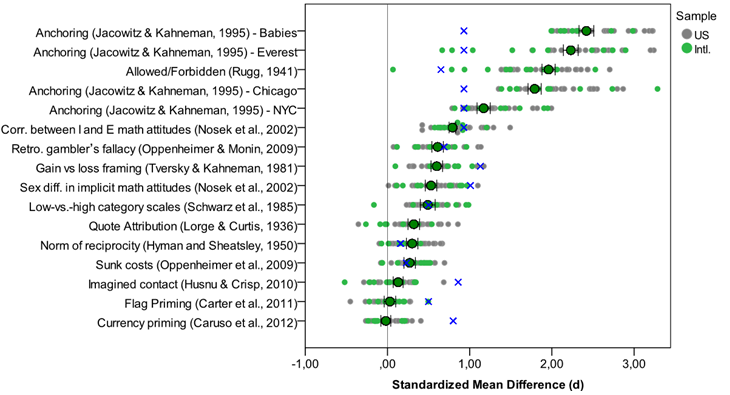 „Revised Standards for Statistical Evidence“. Proceedings of the National Academy of Sciences 110 (4 (November 26): 19313–19317. doi:10.1073/pnas.1313476110. "Recent advances in Bayesian hypothesis testing have led to the development of uniformly most powerful Bayesian tests, which represent an objective, default class of Bayesian hypothesis tests that have the same rejection regions as classical significance tests. Based on the correspondence between these two classes of tests, it is possible to equate the size of classical hypothesis tests with evidence thresholds in Bayesian tests, and to equate P values with Bayes factors. An examination of these connections suggest that recent concerns over the lack of reproducibility of scientific studies can be attributed largely to the conduct of significance tests at unjustifiably high levels of significance. To correct this problem, evidence thresholds required for the declaration of a significant finding should be increased to 25–50:1, and to 100–200:1 for the declaration of a highly significant finding. In terms of classical hypothesis tests, these evidence standards mandate the conduct of tests at the 0.005 or 0.001 level of significance." Im Kontext der Debatte um die Schwierigkeiten, wissenschaftliche Studien zu reproduzieren, argumentiert Valen Johnson, dass das Problem die zu anspruchslosen Signifikanzniveaus sind. Er benutzt eine neue Variante Bayesianischer Tests, die eine direkte Vergleichbarkeit mit den üblichen frequentistischen Tests erlauben soll und zeigt, dass - ausgehend von 50 % korrekten Nullhypothesen - Alternativhypothesen bei dem Standard p-value von 0,05 zu zwischen 18 und 23 % fälschlicherweise als richtig angesehen werden. In den statistischen Wissenschaften fehlt oft eine grundlegende Theorie. Zum Beispiel sind priming Experimente in der Psychologie gerade der letzte Schrei. Etwa derart: man legt Probanden Begriffe vor, wie "jung, behende" oder "alt, träge" und stellt dann fest, daß das ihre Gehgeschwindigkeit beeinflußt. Wenn man den Studien denn glaubt. When particle physicists recently found that some neutrinos had apparently travelled faster than light (Adams et al. 2011) it never actually occurred to them that this is what had happened. On the basis of the extraordinarily well supported theory of relativity, the physics community went ‘that's weird - I wonder what we did wrong?’, and proceeded to use that theory to generate hypotheses they could then test. It would take a lot of fast neutrinos to disprove relativity, and even though the result turned out to be caused by a faulty cable, the robust response by physicists stands as an example of the benefits of a good theory. Die Artikel von Bem zu Precognition haben interessanterweise ja auch eine Welle der Selbstkritik in der Psychologie und umfangreiche Überlegungen zum Replizieren in Gang gebracht. In der Politikwissenschaft gibt es ähnliche Tendenzen in letzter Zeit. Die Soziologie scheint da aber noch etwas hinterher zu sein. Dr. John Stamatoyannopoulos denkt, er und sein Team habe eine Art zweiten Code in der DNA gefunden. Der Rest der Fachwelt staunt ungläubig. Go home PR team, you're drunk. Even the finding that these regulatory regions are embedded within protein-coding sequences is nothing new; they have been discovered in several studies since 1995. The main conclusions of this new study by Dr. John Stamatoyannopoulos and his colleagues is that these regions are more pervasively contained within coding-sequences than previously believed – 87% of genes (from the 81 cell types investigated) contained them. The hype began with the way hype often begins: an institutional news release offering us the holy grail/huge breakthrough/game-changing finding of the day. This kind of exaggeration is the big reason any science consumer should look well beyond the news release in considering new findings. A news release is a marketing tool. You’re reading an advertisement when you read a news release. In this case, the advertisement/news release not only goes off the rails with the hype, it’s also scientifically garbled and open to all kinds of misinterpretation, as the comments at the link to the release make clear. Here’s some of the hype with a soupçon of garble. Since the genetic code was deciphered in the 1960s, scientists have assumed that it was used exclusively to write information about proteins. UW scientists were stunned to discover that genomes use the genetic code to write two separate languages. Viel kann ich nicht zu dieser Meldung sagen, weil mir das zu hoch ist. Sieht aber interessant aus. Eine neue Methode, die ein geometrisches Objekt namens Amplituhedron nutzt, erlaubt es, Ergebnisse von Partikelkollisionen viel einfacher zu berechnen als bisher. Allerdings geht das bisher nur mit einer supersymmetrischen Form der Yang-Mills-Theorie. Tja, SUSY ist wohl falsch. Nima Arkani-Hamed behauptet aber, die Methode sei auch für andere Quantenfeldtheorien geeignet. Perturbative scattering amplitudes in gauge theories have remarkable simplicity and hidden infinite dimensional symmetries that are completely obscured in the conventional formulation of field theory using Feynman diagrams. This suggests the existence of a new understanding for scattering amplitudes where locality and unitarity do not play a central role but are derived consequences from a different starting point. In this note we provide such an understanding for N=4 SYM scattering amplitudes in the planar limit, which we identify as ``the volume" of a new mathematical object--the Amplituhedron--generalizing the positive Grassmannian. Locality and unitarity emerge hand-in-hand from positive geometry. Stephen Parke and Tomasz Taylor, theorists at Fermi National Accelerator Laboratory in Illinois, took that statement as a challenge. Using a few mathematical tricks, they managed to simplify the 2-gluon to 4-gluon amplitude calculation from several billion terms to a 9-page-long formula, which a 1980s supercomputer could handle. Then, based on a pattern they observed in the scattering amplitudes of other gluon interactions, Parke and Taylor guessed a simple one-term expression for the amplitude. It was, the computer verified, equivalent to the 9-page formula. In other words, the traditional machinery of quantum field theory, involving hundreds of Feynman diagrams worth thousands of mathematical terms, was obfuscating something much simpler. Der Thread braucht ein paar mehr Graphiken. Das Interessanteste zuerst: Untersuchung der Entscheidungen von 8 Richtern in 2 parole boards (parole = Haftaussetzung oder Bewährung). Ihre positiven Entscheidungen sinken mit der Dauer ihrer Arbeitsphase. Die Kreise im Graph stellen Beginn, erste Pause und zweite Pause dar. Erstaunlich, falls sich das bestätigt. ...und es dürfte nur die Spitze des Eisberges von willkürlichen Entscheidungen sein. This internationally cooperative study replicated 13 major psychology effects from over seven decades of research using 36 studies and a total sample of 6,344. The x-axis shows the standardized mean difference between the control and treatment group so the interpretation is that the further rightwards the dots are, the stronger the effect is. The blue X is the strength of the effect in the original paper. Eleven of the 13 effects seem to be robust, particularly the anchoring studies which replicate much stronger effects than the original papers. The priming studies did not replicate the effect. Priming-Versuche hatte ich oben schon erwähnt. Die Erwähnung eines Begriffes soll Entscheidungen oder Verhalten beeinflussen. Ankerheuristik (engl. anchoring effect) ist ein Begriff aus der Kognitionspsychologie für die Tatsache, dass Menschen bei bewusst gewählten Zahlenwerten von momentan vorhandenen Umgebungsinformationen beeinflusst werden, ohne dass ihnen dieser Einfluss bewusst wird. Die Umgebungsinformationen haben Einfluss selbst dann, wenn sie für die Entscheidung eigentlich irrelevant sind. Es handelt sich also um eine Urteilsheuristik, bei der sich das Urteil an einem willkürlichen „Anker“ orientiert. Die Folge ist eine systematische Verzerrung in Richtung des Ankers. Interessant finde ich, daß anchoring letztlich eine Art priming mit Zahlen ist. Die Ergebnisse deuten darauf hin, daß Zahlenverständnis etwas anderes ist als Begriffsverständnis. Nicht neu, aber hier schön illustriert. The authors investigated whether people use heuristics when buying a used car - specifically whether potential buyers focus on the left-most digit in the odometer in purchase decisions. 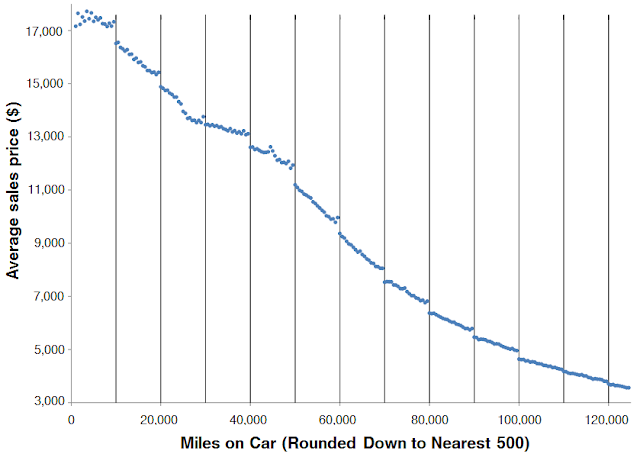 The graph below uses a data-set of over 22 million used-car transactions and shows large, discontinuous drops in sales prices at 10,000 mile intervals in odometer mileage, as well as smaller drops in 1,000 mile thresholds. Hab gestern auch mal reingeschaut - das ist schon ziemlich cool - und danke für den Blog-link, in dem der Autor u.a. selbst Fragen beantwortet. Ich verstehe zwar noch ansatzweise, wie die Yang-Mills-Theorie funktioniert, aber hier muß ich auch passen. Von der Herleitung sieht es seriös aus und macht Sinn, was Dixon schreibt. Step, weißt Du, ob es eine Besonderheit dieser Lösung ist, dass Lokalität und Unitarität als emergente Phänomene beschrieben werden können? Das scheint ja schon etwas mit dem Ganzen zu tun zu haben, aber ich habe nicht ganz verstanden, ob das diese Lösung mit ausmacht. Oder ist es so, dass das auch im ursprünglichen Ansatz bereits so war, der aber eben entsprechend aufwendig war bei der Formel usw.? Step, weißt Du, ob es eine Besonderheit dieser Lösung ist, dass Lokalität und Unitarität als emergente Phänomene beschrieben werden können? Das scheint ja schon etwas mit dem Ganzen zu tun zu haben, aber ich habe nicht ganz verstanden, ob das diese Lösung mit ausmacht. In der Tat, es ist nicht neu, aber wesentlich. Man vermutet (oder weiß) ja bereits, daß es nicht funktioniert, wenn man Lokalität und Unitarität einfach voraussetzt, da man dann die Widersprüche erhält, die Gravitation und QFT unvereinbar machen. Also muß man eine Lösung suchen, die L und U für bestimmte Parameterbereiche produziert - und das ist bei diesem Vorschlag erfreulicherweise der Fall. Oder ist es so, dass das auch im ursprünglichen Ansatz bereits so war, der aber eben entsprechend aufwendig war bei der Formel usw.? Wenn man von einer "klassischen" QFT ausgeht, ist die immer axiomatisch unitär, grob gesagt ist die Unitarität in der Schrödingergleichung enthalten - und damit auch in den Feynman-Diagrammen usw.). Erst neuere Ansätze, z.B. Stringtheorien, versuchen das zu vermeiden. Allerdings waren die bisher alle entweder stark unterbestimt oder zu aufwendig zu berechnen. Auch danke für die weiteren Studien. Komme nur eingeschränkt dazu, es mir anzuschauen, ist aber sehr interessant. Im Prinzip auf eine Replikation, wurde hier mit neueren Methoden eine Analyse eines Lehrers über Freundschaftsnetzwerke aus dem jahr 1880 bestätigt. Heidler, Richard, Markus Gamper, Andreas Herz, und Florian Eßer. 2014. „Relationship patterns in the 19th century: The friendship network in a German boys’ school class from 1880 to 1881 revisited“. Social Networks 37 (Mai): 1–13. doi:10.1016/j.socnet.2013.11.001. The article presents a friendship network from 1880 to 1881 in a school class, which goes back to the exceptional mixed-methods study of the German primary school teacher Johannes Delitsch. The re-analysis of the historic network gives insights into what characteristics defined the friendship networks in school classes in Germany at the end of the 19th century. ERGMs of the so far unmarked data show structural patterns of friendship networks similar to today (reciprocity, transitive triadic closure). Moreover we test the influence of the class ranking order (Lokationsprinzip), which allocates the pupils in the class room according to their school performance. This ranking order produces a hierarchy in the popularity of pupils, through hierarchy–congruent friendship ties going upwards in the hierarchy. In this respect, concerning the effect of school achievement on popularity, we find a strong stratification, which is not always prevalent today. Eine Überraschung - und perfektes Material für Spekulation. Leben auf der Kriechspur: der Metabolismus von Primaten läuft nur halb so schnell wie bei anderen Säugetieren. Durch Gabe von "markiertem Wasser" (Deuterium und Sauerstoff-18 ) haben Pontzer und Kollegen festgestellt, daß Primaten nur halb soviel Energie verbrauchen wie andere Säugetiere. Pontzer and colleagues’ approach highlights an often-overlooked flaw in society’s obsession with metabolism: many online "health" calculators, personal trainers, and even doctors base recommended daily energy intake on your basal metabolic rate (BMR), which is an estimate of the number of calories your body spends just to keep itself alive in a given day—it doesn’t include any movement, growing, healing from wounds, or the costs of reproduction for adults. This focus on BMR may be misguided. [...] Pontzer and colleagues point out that total energy expenditure (TEE) is what actually drives our lifestyles, in terms of acquiring energy, how our bodies allocate their energy budgets, and cellular senescence due to the production of free radicals from metabolic activity. Also, the authors point out that BMR accounts for less than half of the TEE for most mammalian species. 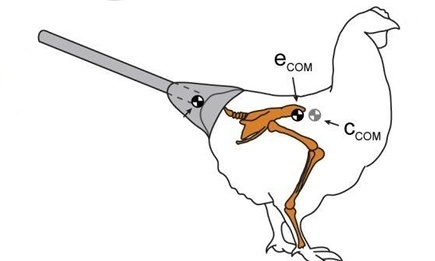 BMR alone doesn’t give us much information about the daily energy requirements and expenditures of an animal, leaving us unable to predict how much energy remains available for growth and reproduction—keys to success in the evolutionary scheme of things. Nach dem letzten Absatz würde ich die 50% nicht mehr wörtlich nehmen, sie scheinen einer journalistischen Überhöhung geschuldet. Das Resultat erscheint mir dennoch verblüffend. Die Autoren behaupten, daß die gesparte Energie bei Menschen aus dem Stamm der Hazda einer täglichen Laufleistung von 45 km entspricht. Das lädt zu Mutmaßungen ein, warum das so ist. This leaves us with an overarching question: why so slow, primates? The authors point out that not only do primates’ cellular metabolic processes lumber along relatively slowly, but their (and our) entire lives move at a leisurely pace relative to other mammals: primates grow and mature slowly, reproduce slowly, and acquire life skills and social status slowly. Instead of taking the “live fast and die young” approach of many other mammals, primates’ relatively long lives afford them the luxury of plodding along. Ehrlich gesagt erscheint mir das Ganze so unplausibel, daß ich es gar nicht glauben mag. Gut: wer weniger Energie verbraucht, kann sich ein größeres Gehirn leisten. Aber warum ein großes Gehirn wie bei uns Menschenaffen den Zusammenhang nicht stört, verstehe ich nicht. Falls die Sache stimmt, könnte es ein interessantes Puzzlestück sein in der Evolution des Menschen. [...] Ehrlich gesagt erscheint mir das Ganze so unplausibel, daß ich es gar nicht glauben mag. Ist so. Manche vermuten, das sei eine Anpassung an tendenziell knappe Ressourcen. Vielleicht liegt es auch daran, dass Primatenbabys noch sehr unreif sind und eine lange elterliche Betreuung benötigen. (In Umkehrung eines Slogans der Life-History-Theorie: "live slow, die old"). Fragt sich, was Ursache ist und was Wirkung. Gut: wer weniger Energie verbraucht, kann sich ein größeres Gehirn leisten. Nein, es ist genau umgekehrt. Am meisten Energie verbrät der Körper für das Beheizen des Hirns, das als einziges Organ außerhalb der Körperhöhle liegt. Deshalb verbrauchen die Menschen von allen Primaten am meisten Energie. Aber warum ein großes Gehirn wie bei uns Menschenaffen den Zusammenhang nicht stört, verstehe ich nicht. Möglicherweise ist ein Grund der, dass Primaten, verglichen mit anderen Großsäugern, relativ wenig Muskulatur besitzen. Das spart Energie. Zudem weist ihr Körper, im Vergleich zu Kleinsäugern, ein geringes Oberflächen/Volumen-Verhältnis auf. Die Spitzmaus hat, bezogen aufs Körpergewicht, einen viel größeren Energieumsatz, weil sie klein ist und daher rascher auskühlt. Man kann ja einfach mehr oder anders essen. Jeder hat bestimmt schon von der Idee gehört, dass die Zubereitung der Nahrung das energiefressende Gehirn ermöglichte. Das Kochen ersetzt demnach einen aufwendigen Teil der Verdauung und liefert die Nährstoffe in leicht verfügbarer Form. Eine Quelle weiß ich nicht, aber Google liefert bestimmt was. Nun müsste man zur Beurteilung dieser Idee noch wissen, wie Kochen und Gehirnvergrößerung zeitlich aufeinander folgten. Man kann einem Bobobo den Umgang mit Feuer beibringen. Habe gerade keine Zeit, sonst würde ich kurz die ältesten Hinweise auf Kochen oder Grillen recherchieren. Hoppla! Die Idee ist also nicht neu und mein Post kommt drei Jahre zu spät. Das habe ich damals verpasst. Sogar der Autor ist der gleiche. Danke für den Hinweis. Neu ist nur, daß nun mehrere Arten untersucht wurden. Das ist vermutlich ein Grund, warum wir so alt werden. Säuger mit raschem Stoffwechsel sterben früh, weil sich die Zellen rascher teilen. In 1926 Raymond Pearl proposed that longevity varies inversely with basal metabolic rate (the "rate of living hypothesis"). Support for this hypothesis comes from the fact that mammals with larger body size have longer maximum life spans and the fact that the longevity of fruit flies varies inversely with ambient temperature. However, the ratio of resting metabolic rate to total daily energy expenditure can vary between 1.6 to 8.0 between species of mammals. Manchmal wird sogar ein Zahl von rund zwei Milliarden Herzschlägen genannt. Manche vermuten, das sei eine Anpassung an tendenziell knappe Ressourcen. Vielleicht liegt es auch daran, dass Primatenbabys noch sehr unreif sind und eine lange elterliche Betreuung benötigen. (In Umkehrung eines Slogans der Life-History-Theorie: "live slow, die old"). Fragt sich, was Ursache ist und was Wirkung. Nein, es ist genau umgekehrt. Am meisten Energie verbrät der Körper für das Beheizen des Hirns, das als einziges Organ außerhalb der Körperhöhle liegt. Der Gesamtverbrauch eines Lebewesens sei 1, davon braucht der Körper den Anteil k und das Gehin g, also k + g = 1. Deshalb verbrauchen die Menschen von allen Primaten am meisten Energie. Möglicherweise ist ein Grund der, dass Primaten, verglichen mit anderen Großsäugern, relativ wenig Muskulatur besitzen. Das spart Energie. Über den relativen Muskelanteil weiß ich nichts. Baumbewohnende Lebewesen stelle ich mir grundsätzlich zierlicher vor als Bodenbewohner. Gorillas aber wären ein Gegenbeispiel. Eine andere Möglichkeit, warum die Energieumsatz von Primaten nach Entwicklung des Gehirns nicht wieder steigt auf das übliche Säugetierniveau. : ein hochentwickeltes Gehirn braucht eine stetige Versorgung. Körpergewicht, Muskeln, Fett kann bei anderen Tieren in Zeiten von Hunger und Nahrungsmittelknappheit schwinden. Gehirnmasse ist kein derartiger Speicher, deshalb ist Sparflamme angesagt. Noch eine andere Möglichkeit. Oben sagtest du: rascher Stoffwechsel, früher Tod. Ein früher Tod ist aber schlecht für ein Gehirn, das lernen kann. So manche Primatenart hat rudimentäre Formen von Kultur. Die Primaten würden sich den Ast absägen, auf dem sie sitzen, wenn sie ihre Stoffwechselrate nur wieder hochschraubten. Uff, das war jetzt eine ganze menge, ganz wilde Spekulation. Zudem weist ihr Körper, im Vergleich zu Kleinsäugern, ein geringes Oberflächen/Volumen-Verhältnis auf. Die Spitzmaus hat, bezogen aufs Körpergewicht, einen viel größeren Energieumsatz, weil sie klein ist und daher rascher auskühlt. Aber wo kommt der Unterschied zwischen den beiden Geraden her? Ist es der Körperbau, der den Unterschied macht? Ich denke nicht. Mäuse und Elefanten sind in grober Näherung sogar noch kugelförmig, währen Primaten zu schlauchförmigem Körper mit langen, abstehenden Gliedmaßen tendieren. Eigentlich sollten Primaten schlechter wegkommen. Bleibt eigentlich nur ein effizienterer Metabolismus. "uns Menschenaffen" war ganz schlecht formuliert. Gemeint war nicht nur der Mensch, sondern alle great apes. Ich hab' mich gefragt, warum Menschenaffen keine Ausreißer sind im Graph? Sie sollten sich "intellektuell" noch einmal vom Rest der Primaten abheben, ohne bei der Nahrungsbeschaffung wesentlich mehr Möglichkeiten zu haben. Einer der schönsten Artikel, über die ich je gestolpert bin. Gefällt mir, weil er Überlegungen zu Populationsdynamik nutzt, um anthropologische Thesen zu beantworten. Er geht der Frage nach, warum die Landwirtschaft erst im Holozän entstanden ist. Leider ist das nicht meine Ecke, deshalb kann ich nicht sagen, ob das Standardmeinung ist oder Außerseiteransicht. Den Artikel zur Geschichte der Landwirtschaft im aktuellen Spektrum der Wissenschaft fand ich im Vergleich nicht so erhellend. Warum ist Landwirtschaft nicht schon früher entwickelt worden? Die Autoren greifen insbesondere diese These an: Landwirtschaft sei durch steigenden Bevölkerungsdruck "erzwungen" worden. Population Growth Has Wrong Time Scale. Cohen’s (1977) influential book argued that slowly accumulating global-scale population pressure was responsible for the eventual origins of agriculture beginning at the 11,600 B.P. time horizon. He imagines, quite plausibly, that subsistence innovation is driven by increases in population density, but, implausibly we believe, that a long, slow buildup of population gradually drove people to intensify subsistence systems to relieve shortages caused by population growth, eventually triggering a move to domesticates. Ihre Argumentation hat drei Kernpunkte. Die Autoren geben Beispiele für heutige Ernteausfälle durch Klimaextreme. Dann zeigen sie, daß das Klima im Pleistozän wesentlich größeren Schwankungen unterlag. Landwirtschaft wäre keine verlässliche Lebensgrundlage gewesen. Figure 2. High resolution analysis of the GRIP ice core d18O data by Ditlevsen, et al. (1996). The low pass filtered data shows that the Holocene is much less variable than the Pleistocene on time scales of 150 years and longer. The high pass filtered data shows that the Pleistocene was also much more variable on time scales less that 150 years. 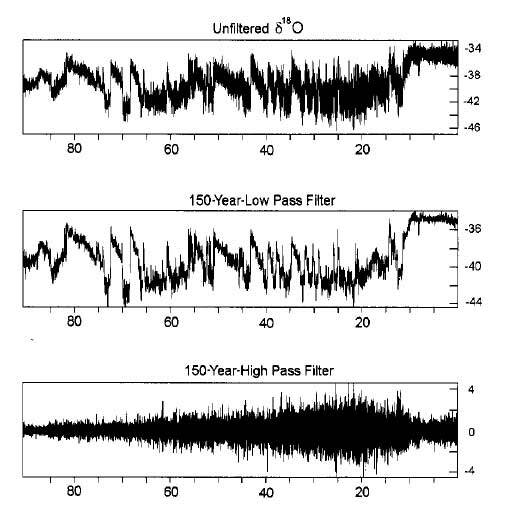 The high and low pass filtering used spectral analytic techniques. These are roughly equivalent to taking a 150 year moving average of the data to construct the low pass filtered series and subtracting the low pass filtered series from the original data to obtain the high pass filtered record. Since diffusion increasingly affects deeper parts of the core by averaging variation on the smallest scales, the high pass variance is reduced in the older parts of the core. In spite of this effect, the Pleistocene/Holocene transition is very strongly marked. Der CO2-Gehalt in der Atmosphäre war im Pleistozän zu niedrig für Landwirtschaft. Ernteerträge hängen vom CO2-Gehalt ab. Figure 3. Panel a shows the curve of atmospheric CO2 as estimated from gas bubbles trapped in Antarctic glacial ice. Data from Barnola et al. (1987). Panel b summarizes responses of several plant species to experimental atmospheres containing various levels of CO2. 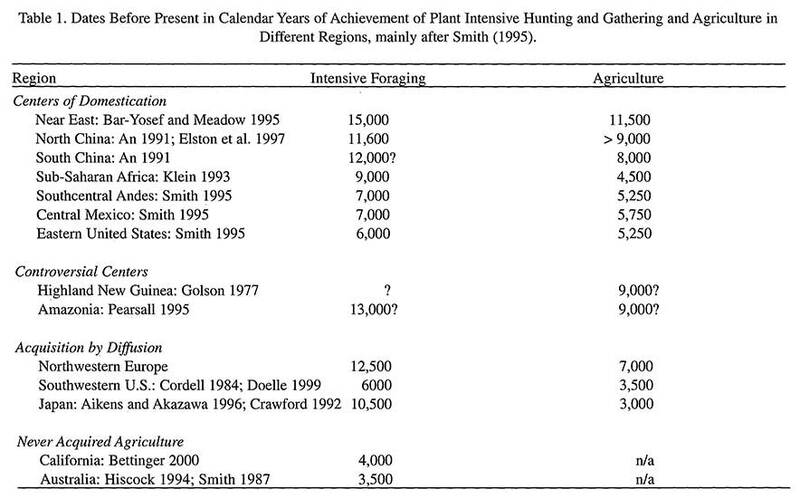 Based on data summarized by Sage (1995). Meiner Ansicht nach ist es geschummelt, wenn man Achsen beschneidet. Bevölkerungsdynamik passt nicht zu Zeiträumen. Boyd, Richerson und Bettinger nutzen eine 80 Jahre alte Differentialgleichung von R. A. Fischer, die die Ausbreitung von nützlichen Genen in einer Population beschreibt. Damit schätzen sie ab, wie schnell eine Bevölkerung in Richtung Tragkapazität wächst, nachdem neue Nahrungsquellen erschlossen werden. Ihr Ergebnis: wegen der exponentiellen Natur von Wachstumsprozessen geht das recht schnell. Once, after listening to one of us propound this argument, a skeptical archaeologist replied, “But you’ve got to fill up all of Asia, first.” This understandable intuitive response betrays a deep misunderstanding of the time-scales of exponential growth. Suppose that the initial population of anatomically modern humans was only about 10^4 and that the carrying capacity for hunter-gatherers is very optimistically 1 person per square kilometer. Given that the land area of the Old World is roughly 10^8 km², p0 = 10^4/10^8 = 10^–4. Then using equation 2 and again assuming r = 0.01, Eurasia will be filled to 99% of carrying capacity in about 1400 years. The difference between increasing population pressure by a factor of 100 and by a factor of 10,000 is only about 500 years! Agriculture was impossible during the last glacial. During the last glacial, climates were variable and very dry over large areas. 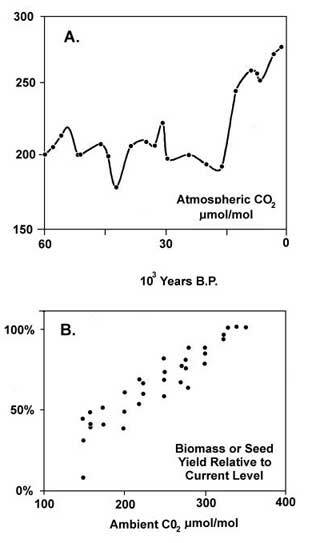 Atmospheric levels of CO2 were low. Probably most important, last glacial climates were characterized by high-amplitude fluctuations on time-scales of a decade or less to a millennium. Because agricultural subsistence systems are vulnerable to weather extremes, and because the cultural evolution of subsistence systems making heavy, specialized, use of plant resources occurs relatively slowly, agriculture could not evolve. In the long run, agriculture is compulsory in the Holocene. In contrast to the Pleistocene, stable Holocene climates allowed the evolution of agriculture in vast areas with relatively warm, wet climates, or access to irrigation. Prehistoric populations tended to grow rapidly to the carrying capacity set by the environment and the efficiency of the prevailing subsistence system. Local communities that discover or acquire more intensive subsistence strategies will increase in number and exert competitive pressure on smaller populations with less intensive strategies. Thus, in the Holocene, such inter-group competition generated a competitive ratchet favoring the origin and diffusion of agriculture. Insbesondere zum CO2-Argument würde ich gerne Gegenargumente hören. Folgendes ist schon alt. Originalquelle habe ich nicht, die kostet. Versuchspersonen wurde eine zufällige Folge von roten oder blauen Karten gezeigt. 70% der Karten waren blau, 30% rot. Die Versuchspersonen durften auf das Erscheinen einer Farbe wetten. In 70% ihrer Wetten setzten sie auf blau. Es entging ihnen, daß ihr Wettmuster nicht mit der beobachteten Folge von Karten übereinstimmen mußte. In jeder Runde ist blau die wahrscheinlichste Wahl. Die beste Strategie ist nicht, meist blau zu wetten, sondern ständig. Information versus reward in binary choices. Subjects were shown a succession of cards, each card either red or blue. 70% of the cards were blue, and 30% red; the color sequence was random. The subjects, asked to bet on each succeeding card, would guess blue around 70% of the time, and red about 30% of the time. 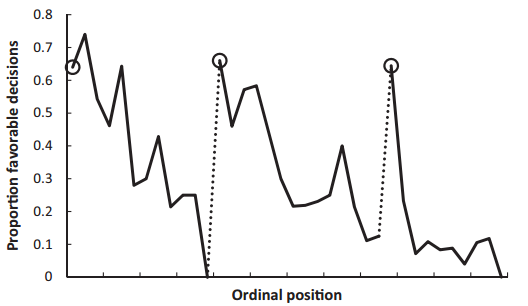 They didn't realize that their betting pattern did not have to resemble the observed sequence of cards. On each round, blue is the most likely next card. The best strategy is not betting a mostly-blue pattern resembling the mostly-blue sequence, but betting all blue. MODERN cosmology has been spectacularly successful at explaining why the universe is as it is – a geometrically flat expanding space pockmarked with stars and galaxies. But this very success means that attempts to understand its origin increasingly stray into issues beyond physics and into the realm of philosophy, for which cosmologists rarely have any formal training. Likewise, when philosophers, untrained in astrophysical subtleties, pronounce on cosmology, the cosmologists are unimpressed. Clearly both groups have much to learn from each other. Our ever-expanding universe is incomprehensibly large – and its rate of growth is apparently accelerating – but if so it's actually in a very delicate balance. It's then incredible that the universe exists at all. Let us explain. As Silk explains, "Drawing the line between philosophy and physics has never been easy. Perhaps it is time to stop trying. The interface is ripe for exploration." In a similar vein, string theory, the current best candidate for a "theory of everything," predicts an enormous ensemble, numbering 10 to the power 500 by one accounting, of parallel universes. Thus in such a large or even infinite ensemble, we should not be surprised to find ourselves in an exceedingly fine-tuned universe. But others see no alternative to some form of the multiverse and the Anthropic Principle. Physicist Max Tegmark, in his recent book Our Mathematical Universe, argues that not only is the multiverse real, but in fact that the multiverse is mathematics—all mathematical laws and structures actually exist, and are the ultimate stuff of the universe. Meine Sicht auf diese Themen hat sich jüngster Zeit etwas gewandelt. Inzwischen denke ich, solche Thesen haben keinen fassbaren Gehalt, auch wenn sie metaphysisch faszinierend sind. String-Theorie ist nicht die "Theory of Everything", sie ist eine "Theory of Anything". Sie kann alles und jedes erklären, jede mögliche Welt. Was nutzt eine These, die sagt: es könnte so sein, aber auch anders? Tegmarks mathematisches Universum - natürlich hat das Universum eine regelmäßige = mathematische Struktur. Das ist meiner Ansicht nach ein no brainer. Wie oft wurde schon gesagt, Gott sei ein Mathematiker? Tegmarck liefert nur die säkulare Variante dieses Gedankens. Daraus lernen wir aber nichts über die konkret vorliegende Struktur und wie es dazu kam. Typ V - Simula-Multiversum: sollten wir irgendwann anfangen, eine Welt zu simulieren, so liegt der Gedanke nahe, auch unsere Welt könne eine Simulation sein. Die Gesetze unserer Welt wären willkürliche Setzungen der Programmierer. Vergesst String-Theorie. Es geht darum, die Intentionen der Programmierer herauszufinden. Eine gute Heuristik, um eine These zu testen, ist der Versuch, sie ins Absurde zu treiben. Auf smileys habe ich verzichtet, bitte gedanklich ergänzen. Typ VI - das hartcodierte mathematische Universum. Ich hab Tegmarcks Buch nicht gelesen, erwähnt er, daß man ein mathematisches Universum auch ohne mathematische Gleichungen beschreiben kann - sofern das Universum simuliert oder die Raumzeit gequantelt ist? Dann reicht ein langer String, in dem alles codiert ist, was im Universum geschieht. Der String kann jederzeit als Zahl gelesen werden. Die berühmte Lösung von Adams, 42, ist aber bestimmt falsch. Typ VIb - das Multiversum der Eulerschen Zahl, meinetwegen auch pi-Multiversum. Da e und pi Normale Zahlen sind, findet sich irgendwo in den Stellen auch obiger String, der unser Universum codiert. Die Forschung sollte sich deshalb darauf konzentrieren, welche Normale Zahl unser Universum am Besten beschreibt. Typ VII - das Universum des mathematischen Schindludertreibens aka, das Multiversum der undifferenzierbaren Funktionen. Tegmarks Version des mathematischen Universums scheint eine Sammlung stetig differenzierbarer Funktionen zu sein. Irgendwo in seinem Lösungsraum ist die Antwort auf unsere heutigen Probleme mit Singularitäten versteckt. Wo genau, das kann er nicht sagen. Aber das nur nebenbei. Worauf ich hinaus will: ich kann auch mit Tegmarcks mathematischem Universum Schindluder treiben. Aus der Menge aller seiner mathematischen Beschreibungen wähle ich jene aus, die die selben "Entitäten" enthalten. Diese nummeriere ich: 1, 2, 3, 4... Dann bau ich mir einen Schalter, zum Beispiel indem ich Zeit t modulo der Anzahl der Beschreibungen nehme. Was als Rest herauskommt, schaltet zwischen den 1 .. n Beschreibung um und bestimmt, was für diesen Zeitabschnitt gilt. Mathematisch scheint mir das machbar zu sein. Jedem Physiker, jedem Empiriker, dürften bei diesem Schindluder die Haare zu Berge stehen. Die üblichen Multiversumstheorien können nur regelmäßige Universen erklären. Meine Varianten zum nicht stetig differenzbaren Multiversum haben noch viel mehr Freiheitsgrade. Sie sind deshalb die mächtigere Theorie. Ich hoffe ich habe das Prinzip jetzt genug malträtiert, um meine Kritik anschaulich zu machen. Ein Philosoph nach meinem Geschmack würde sagen: "Grämt euch nicht. Zu jeder Zeit gibt es Dinge, die mysteriös erscheinen. Trennt sauber zwischen Theorie, These und Metaphysik, bleibt auf dem Boden der Tatsachen - dann fällt auch ein Hans-Guck-in-die-Luft nicht auf die Schnauze." interferes with the key useful roles of stories in the scientific process. Sehr interessanter Text, welche Rolle *gute* Stories - nicht nur - in der Sozialforschung spielen und was das mit Statistik zu tun hat. Ich mag Geschichten. Das Schöne an Geschichten, Gedankenexperimenten, Beispielen ist, daß sie konkret und darum wenig mißverstehbar sind. Bei abstrakt gesagtem weiß ich nie, ob sich mein Verständnis des Gesagten mit dem Gemeinten deckt. Der Ansatz erinnert mich ein bisschen an John Allen Paulos Es war 1mal / Once upon a number. Die Geschichte von der Karte in ihren drei Varianten fand ich köstlich. Second, we discuss political scientist Robert Axelrod’s highly influential gametheoretic model of cooperation in the trenches during the First World War. As Gowa (1986) showed, Axelrod's analysis can be disputed using details that can be found both in Axelrod's careful retelling of the story and his scrupulously referenced sources. Ich muß mir mal durch den Kopf gehen lassen, was im Artikel weiter unten kurz angerissen wird. Diese Bemerkung ist etwas zu kurz, um wissen zu können was gemeint ist. Aber bei Tschechow denke ich an seine Forderung: Man kann kein Gewehr auf die Bühne stellen, wenn niemand die Absicht hat, einen Schuss daraus abzugeben. Und: Wenn im ersten Akt ein Gewehr an der Wand hängt, dann wird es im letzten Akt abgefeuert. In der Statistik sollte das anders sein - wenn man sauber arbeitet und auch von den verworfenen Hypothesen berichtet. Das ist wunderschön. Aber bisher nur eine Hypothese. Unterschiedliche Tiere machen unterschiedliche Geräusche. Ein Amateur behauptet, die Geräusche, die die unterschiedlichen Art machen, fänden in unterschiedlichen Frequenzbereichen statt. Salopp gesagt, sendet jede Art auf ihrer eigenen Frequenz. Zumindest in stabilen Ökosystemen sei das so. Das hat sich herumgesprochen. Inzwischen laufen Feldversuche, um zu sehen, ob sich anhand von Aufnahmen der Bioklangsphäre etwas über den Zustand eines Ökosystems sagen läßt. Übrigens, der Artikel ist keine wissenschaftliche Veröffentlichung, sondern Journalismus. In his home studio, [...] Krause plays me some of his favorites: a Florida swamp, old-growth forest in Zimbabwe, intertidal mangroves in Costa Rica, and a Sierra Nevada mountain meadow. As the sounds pour from speakers mounted above his computer, spectrograms scroll across the screen, depicting visually the timing and frequency of every individual sound. They look like musical scores. Researchers are now recording dozens of landscapes across the world and computationally translating thousands of hours of recordings into numerical indexes of ecological conditions, and ultimately the human impacts on them. These are not ready for practical application. The biophony, formally known as the “niche hypothesis,” is still a hypothesis. It’s not yet possible to hear whether an ecosystem is healthy. Bin gespannt, ob daraus was wird. Milde Kritik ist angebracht wegen der undifferenzierten Verwendung von "healthy". Ein Ökosystem könnte gesund und trotzdem im Umbruch sein. Ungesund wäre eine Verarmung. Und auch das läßt sich hinterfragen. Ohne mehrfache Verarmung nach evolutionären Katastrophen gäbe es uns heute vermutlich nicht. Ob man mit dieser Methode mehr herausbringen kann, als mit einer herkömmlichen Zählung der Artenvielfalt in einem Habitat? Vielleicht geht es mit der akustischen Variante einfacher, kleinräumiger und billiger. Val’s approach is to apply a minimax argument leading to a more stringent p-value threshold, whereas I’d be more interested in not using p-values (or related quantities such as Bayes factors) as publication thresholds at all. But we agree that the current system is broken. Warum fällt mir jetzt flexible response als Schlagwort ein? Kommt aus einer anderen Ecke, könnte hier aber passen. Hat SCIgen, die Software, aus der die Texte stammen, nun den Turing-Test bestanden, oder sind nur die reviewer durchgefallen? Lazer, David, Ryan Kennedy, Gary King, and Alessandro Vespignani. 2014. The Parable of Google Flu: Traps in Big Data Analysis. Science 343, no. 14 March: 1203-1205. Hab's selber noch nicht genau durchgelesen, aber auf jeden Fall empfehlenswert und interessant zum Thema "Big Data". - Narzissten zeigen jedoch typische Empathiesymptome, wenn sie aufgefordert werden, sich in die Opfer hineinzuversetzen. Mehr scheint erstaunlicherweise nicht notwendig zu sein. - (übrigens) Männer zeigen fast ausschließlich Empathie für diejenigen, die sich zuvor fair und untadelig verhalten haben, Verräter und unfaire Zeitgenossen dulden sie nicht. Frauen leiden zwar auch stärker mit den Gerechten, aber in erheblichem Maße verspüren sie ebenso Mitgefühl mit den Fieslingen. - Eine Anekdote vom Stamm der Babemba: Ein Übeltäter muß in die Mitte eines Menschenkreises. Dort wird er aber nicht bestraft, sondern so lange an seine guten Eigenschaften erinnert, bis er wieder mit angenehmen Gefühlen in die Dorfgemeinschaft zurückkehren kann.